I am able to display the icons in the Internet Explorer if I remove the extra slash from the URL. [FIXED JENKINS-23677] Removed leading slash from image URL. 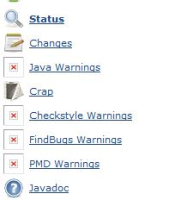 SCM/JIRA link daemon added a comment - 2014-08-05 21:54 Code changed in jenkins User: Ulli Hafner Path: src/main/java/hudson/plugins/analysis/core/AbstractProjectAction.java http://jenkins-ci.org/commit/analysis-core-plugin/a628f770e6644f9ffcea40273272a944f527c45d Log: [FIXED JENKINS-23677] Removed leading slash from image URL. When will you make the fix available for the download? Pavel Saab added a comment - 2014-08-12 12:29 When will you make the fix available for the download?